“Content Shock” coined by Mark Schaefer, refers to the rising amount of content posted on the internet on the various channels vs. the finite ability of people to consume all that content. In talking with Mike Barrett, he shared with me a infographic on video content. What’s important to note is that if you want to reach an audience, then video can be the most effective method. And YouTube has a large number of viewers. But it isn’t just about the numbers. YouTube also creates unique relationships with viewers that few other sites can claim. Here’s more of Mike’s thoughts on the topic and important reasons why YouTube can’t be ignored by anyone who is creating content. With the expansion of channels to reach an audience and the volume of content, whether you are a Marketer, an entrepreneur, a content creator, or simply an entertainer, it is difficult to succeed in a competitive online landscape without video in 2018. Video is now the expectation among people online who are seeking interesting content or valuable information. There is a lot of evidence to suggest that not only is video more popular, but it is also more effective in delivering your message. For example, people remember as much as 80% of what they watch as opposed to merely 20% of what they read. With improved bandwidth more video/ vlog content created every day, YouTube has maintained its position as the top video platform, even as other massive sites like Facebook have started leaning into video heavily. 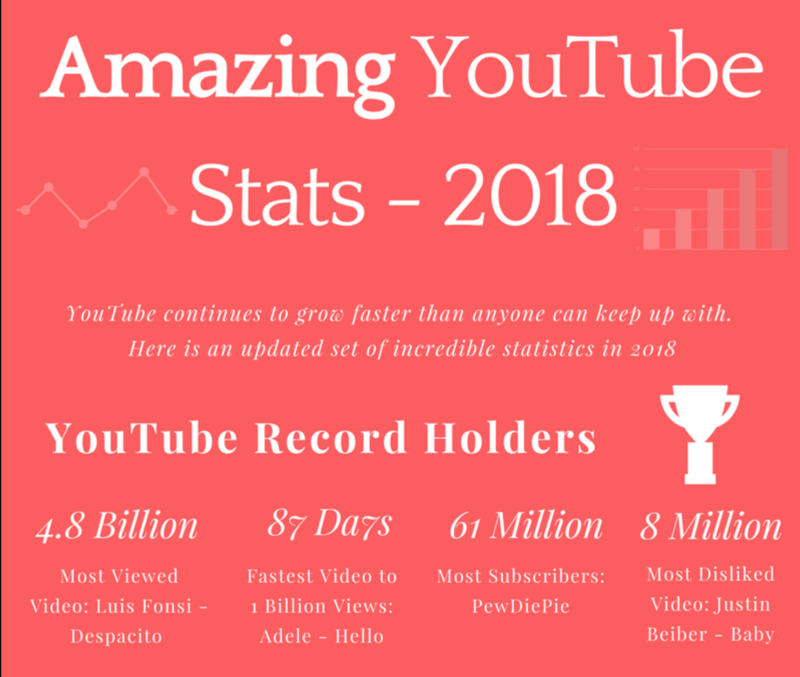 YouTube has cleared an astonishing 1.5 Billion users and has over 5 million independent channels regularly contributing new content. There is more content than any one person could hope to consume – as many as 400 of hours of new video are uploaded to YouTube every minute! And this where the whole infographic from Mike Barrett – with many more statistic from Vlogging Guides – can be found. Since it was formed in 2006, YouTube has come a long way since funny cat videos. It is now a credible source of information for many in both their personal and professional lives. YouTube is the second most popular search engine in the world behind only Google which means that a startling number of people are actually turning to YouTube first when they have a question that they need help answering. That is significant – if you can produce videos that answer those questions and solve those problems, then you can build an engaged audience who will trust your brand and your voice. Video as a medium has proven that it is effective. Forty-four percent of people report that they have taken action specifically due to an online video, and videos have shown that they improve conversion rates on sales pages, or within emails. YouTube is not a site that people use to skim headlines. In fact, an average YouTube user watches 1 hour of video per day on the site. Much of this is due to the many high-quality content producers, but the engineers at YouTube deserve some credit as well. The site is intelligently designed to maximize use viewing time by promoting videos that perform well in user satisfaction metrics. It uses a sophisticated search algorithm that helps surface the videos that fit exactly what a user is looking for. This is supported by personalized recommendations that give users a number of suggested videos that are related to content that they have engaged with in the past. YouTube’s total view time increase 10x between 2012 and 2017, and it is showing no signs of slowing. One of the main reasons this upward trend is likely to continue is that younger people have shown that they use the platform that most. 95% of 13-17-year-olds in the US are regular YouTube users, the most of any age bracket. As more young viewers enter prime YouTubing age, and the platform grows in international markets, YouTube likely still has a long way to go before it reaches its ceiling. This is one of many reasons why it is not too late to establish yourself on this platform now, and why it is critical to do so in 2018. Thanks Mike for gathering the stats on YouTube! Appreciate you sharing them with me and giving me the opportunity to share them with everyone!